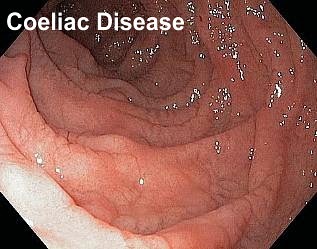 Coeliac disease is caused by a reaction to gluten, a protein found in wheat, and other similar proteins found in rye, barley and oats. These proteins damage the small finger-like projections (villi) that line the small intestine and play a significant role in digestion. When damaged and inflamed, the villi are unable to absorb food properly, which often causes diarrhoea and malnutrition. Diarrhoea is one of the most common symptoms to affect people of all ages with coeliac disease. Children may not gain weight or grow properly, while adults may find they lose weight. Malabsorption can also leave people tired and weak, because of anaemia caused by iron or folate deficiency. Other possible symptoms include mouth ulcers, vomiting and abdominal pain. An itchy rash on the elbows and knees, called dermatitis herpetiformis, may occur. Possible long-term problems include infertility, osteoporosis and bowel cancer. The average incidence in the UK is one in 100 people and men and women seem to be affected equally. The condition runs in families and was once thought to affect only children. However, many adults are now being diagnosed with the disease. It's particularly common between the ages of 30 and 45. Coeliac disease is more common among people with type 1 (insulin-dependent) diabetes, autoimmune thyroid disease, osteoporosis, ulcerative colitis and epilepsy. People from the west of Ireland are more often affected, as are those from the Punjab region of India, Pakistan, the Middle East and North Africa. It's important to consult your GP if you suspect coeliac disease. It's possible people who think they have wheat intolerance may have undiagnosed coeliac disease. Breastfeeding and delaying the introduction of foods containing gluten until after four months may prevent children from developing coeliac disease, but there's no definitive way to stop it developing. A specialised blood test has been developed to help doctors decide whether or not a patient has coeliac disease. In the past, anyone suspected of having the condition would've had a biopsy taken from the intestine by a hospital specialist. Although this is still necessary to confirm diagnosis, it's usually only done when the blood test has demonstrated that coeliac disease is the likely cause of symptoms. What's The Treatment Of Coeliac Disease? There's no cure for coeliac disease, but it can be controlled by following a gluten-free diet for life. This allows the damaged villi to recover and nutrients can then be absorbed normally again and symptoms disappear. The risk of someone with coeliac disease developing bowel cancer is believed to be no more than that of someone who doesn't have coeliac disease, provided they stick to a gluten-free diet. It's essential to consult a dietician to understand which foods are gluten-free (fruit, vegetables, fresh meat, fish, cheese, eggs, and milk) and which contain wheat, barley and rye, and should be avoided or replaced with products such as rice or corn flour. Recipe books and gluten-free foods are readily available. Regular tests are recommended to check for osteoporosis, so that appropriate treatment can be given if necessary. A diet rich in calcium and vitamin D and regular weight-bearing exercise are essential to help prevent osteoporosis from developing. Scientists in the UK are studying the effects of gluten on the intestine. In future, it may be possible to block the damaging effects of gluten on the gut, so people with coeliac disease are able to eat any food they wish.